Circulating CD8+ CD28- T cells were found to be expanded more in patients with ankylosing spondylitis than in an age-matched healthy population (41.2 ± 17.7% versus 18.6 ± 7.6%). The level of CD8+CD28- T cells was dependent on the disease status, but was independent of age. 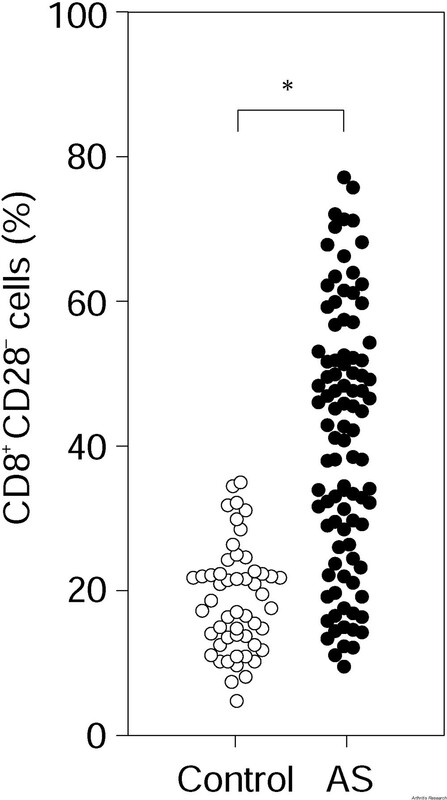 Most of the CD8+ CD28- T cells produced perforin after stimulation in vitro, in contrast to their CD8+CD28+ counterparts. From the clinical perspective, the percentage of the cytotoxic CD8+ CD28- T cells reflected a more severe course of disease, as it correlated with distinct movement restrictions, as well as the metrology score summarizing cervical rotation (in sitting position), chin-to-jugulum distance, thoracic Schober, chest expansion, and fingers-to-floor distance (P = 0.032). Ankylosing spondylitis (AS) is a seronegative spondyloarthropathy that is frequently associated with human leucocyte antigen (HLA)-B27; 90% of AS patients test HLA-B27 positive. HLA-B27 physiologically binds antigenic peptides and thus presents them to CD8+ T lymphocytes. Single HLA-B27 restricted cytotoxic T lymphocytes (CTLs) have been described in AS patients with specificity for arthritogenic bacteria, viral peptides or autoantigens such as peptides derived from the HLA-B27 molecule itself [1,2,3]. CTLs have been reported to maintain the inflammatory process even after the eradication of the microbial pathogen by antimicrobial immune responses . In vivo, MHC-class I restricted CD8+ T cells are clonally expanded and use various αβ T cell-receptors [5,6]. Some of these CD8+ T cell clones represent even more than 50% of all CD8+T cells in single AS patients [7,8,9]. This oligoclonal population which recognizes specific MHC-class I / antigen complexes is characterized by a distinct CD28-CD57+ CD11ahigh phenotype . The presence of this oligoclonal CD28- population in a larger cohort of AS patients has not been examined before. It has been suggested, therefore, that the amount of CD8+ CTLs in a peripheral blood sample can be estimated by determining the percentage of CD8+ CD28- T cells. Furthermore, identification of CD8+ CTLs by the lack of CD28 has provided a helpful tool to investigate this lymphocyte subset in healthy subjects and patients with various diseases . In the healthy population, CD8+ CD28-T cells are not present at birth, and the percentage of CD8+ CD28-T cells increases with age [12,13,14]. This increase of CD8+ CD28-cells, together with reduced circulating naive CD8+ T cells correlates with immunodeficiency during aging [15,16]. As CD8+ CD28-T cells have shortened telomeres, they may have reached a state of replicative senescence . The question as to whether such accelerated senescence is a consequence of viral infections remains open. There may be a role for Epstein–Barr virus (EBV) in the pathogenesis of AS, as different HLA-B27 subtypes are able to present the same EBV peptide . Hyper-responsiveness to EBV has also been observed in AS patients . Irrespective of EBV, CD8+ CD28- T cells are markedly expanded in cytomegalovirus (CMV) seropositive healthy individuals and seropositive patients with rheumatoid arthritis [19,20]. The aim of this study was to quantify the CD8+ CD28-compartment in a cohort of AS patients in comparison with a healthy control group, and to correlate the level of these cells with clinical parameters of disease progression and seropositivity to EBV and CMV. Patients with definite AS (as defined by the modified New York criteria ) were recruited from the Gasteiner Heil-stollen Hospital (Bad Gastein-Böckstein, Austria). A total of 95 patients with definite AS (13.7% female) and 53 healthy volunteers (45.3% female) were enrolled in the study (for patients' characteristics see Supplementary Table 1). In the controls, acute or chronic inflammatory diseases were excluded by physical examination and detailed history. Patients and controls did not differ in age (49.1 ± 11.4 versus 48.0 ± 14.0 years, respectively). Forty-five AS patients did not take any medication, the others took nonsteroidal anti-inflammatory drugs (n = 47), corticosteroids (n = 8), sulfasalazine (n = 2) or azathioprin (n = 1). Patients with multiple drug intakes were considered in all groups separately. AS, ankylosing spondylitis; BASFI, Bath Ankylosing Spondylitis Functional Index; BASMI, Bath Ankylosing Spondylitis Metrology Index; ESR, erythrocyte sedimentation rate; HAQ-S = Health Assessment Questionnaire; G/l, giga/liter; T/l, tara/liter. Surface staining of peripheral blood mononuclear cells was performed using FITC-conjugated anti-CD8, phycoerythrin-conjugated anti-CD28 and peridinin-chlorophyll-protein-conjugated anti-CD3 or anti-CD8 monoclonal antibodies (Becton Dickinson, San Diego, CA). For intracellular detection of perforin or interferon-γ (IFN-γ), stimulated cells were stained for their surface antigens, CD28 and CD8, and with FITC-conjugated anti-perforin, anti-IFN-γ or control immunoglobulin, respectively. Investigators assessing EBV- and CMV-seropositivity were blinded to the sera of 30 AS patients of different ages, with variable percentages of CD8+CD28- cells. Anti-EBV and anti-CMV IgG antibodies were determined according to the manufacturer's instructions using ELISA kits from Aventis Behring (Vienna, Austria). The Mann–Whitney test, the two-sided Pearson test and regression analysis by ANOVA were performed using the SPSS program, version 10.0 (Chicago, IL, USA). Bonferroni adjustment was performed in case of multiple testing. Peripheral blood from 95 AS patients and 53 healthy controls was analyzed by flow cytometry for the presence of CD28- cells in the CD3+ CD8+compartment. The percentage of CD3+ CD8+ T cells lacking the co-stimulatory marker CD28 was significantly increased in all AS patients compared to their age-matched healthy controls (Fig. 1). In AS patients, the mean of the percentage of CD8+ CD28- T cells was 41.1 ± 17.7%, compared to 18.6 ± 7.6% in the healthy controls (P < 0.0001). This increase of CD8+ CD28- T cells was paralleled by a decrease of the CD8+ CD28+ subset. When the level of 30% CD8+CD28- T cells was selected as a cut-off value, 68.4% of the AS patients, but only 9.4% of the healthy controls had higher levels than the cut-off value. Accumulation of CD8+ CD28- cells in peripheral blood mononuclear cells of 95 patients with ankylosing spondylitis (AS) (●) and 53 age-matched healthy controls (○). Cells were stained with fluorescence-marked antibodies directed against CD3, CD8 and CD28 and flow cytometry was used to count CD3+, CD8+, CD28+ and CD28-cells. The Mann–Whitney test was used to determine the statistical difference between patients and the healthy control group. *P < 0.001. The finding of elevated levels of CD8+ CD28- T cells was independent of the patients' age (Fig. 2a). Regression lines were calculated as y = 0.2x + 30.6 for AS patients (R2 = 0.019) and y = 17.1 for the healthy controls (R2 = 0.003). In the ANOVA regression model AS disease, but not age, was an independent parameter for increased levels of CD8+ CD28- T cells. In receiver operating curves (ROC), the areas under the curve were calculated to be 0.861 for AS disease and 0.545 for age (Fig. 2b). Age dependence of the percentages of CD8+ CD28- T cells in the peripheral blood. (a) The levels of CD8+ CD28- T cells are shown in correlation with age. Regression lines were calculated for patients with ankylosing spondylitis (AS) (●, unbroken line) and healthy controls (○, dashed line). (b) A regression model was applied to determine the possible effects of AS disease and age on the level of peripheral CD8+ CD28- T cells. Receiver operating curves (ROC) and the area under the curve (AUC) were determined for both independent parameters. For functional characterization of CD8+ CD28- T cells in AS patients, flow cytometric single cell analysis was used, and the intracellular accumulation of perforin and IFN-γ were compared between CD28+ T cells and CD28-CD8+ T cells. 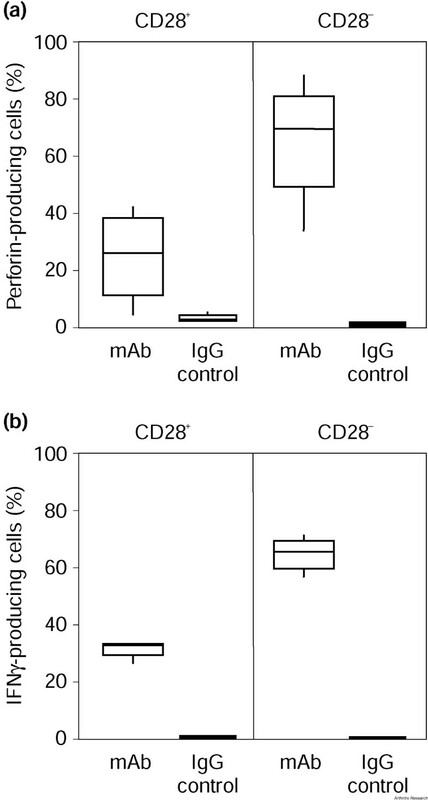 Production of perforin was more frequent in CD28- CD8+ T cells (83.9 ± 17.3% versus 1.6 ± 1.2% stained with IgG control antibodies) than in their CD28+ counterparts (21.3 ± 12.0% versus 3.8 ± 1.8% stained with IgG control antibodies) (P < 0.001) (Fig. 3a). Production of IFN-γ was more frequent in CD28- CD8+ T cells (61.4 ± 10.1% versus 0.35 ± 0.0% stained with IgG control antibodies) than in their CD28+ counterparts (30.9 ± 3.2% versus 0.6 ± 0.2% stained with IgG control antibodies) (P < 0.001) (Fig. 3b). Intracellular production of perforin and interferon-γ in CD8+ CD28- and CD28+ T cells. Peripheral blood mononuclear cells of patients with ankylosing spondylitis were stimulated with phorbol 12-myristate 13-acetate and ionomycin in the presence of brefeldin A. Cells were stained with fluorescence-marked monoclonal antibodies (mAbs) directed against CD8, CD28 and either perforin or interferon-γ and counted by flow cytometry. Whiskers boxblots show the results of 5 independent experiments for perforin (a) and 6 experiments for interferon-γ (b) with 50 % of cases within the boxes and 80 % between the endpoints of the whiskers (lines). The Mann–Whitney test was used to determine the statistical difference between the percentage of perforin-positive or interferon-γ-positive CD28+ and CD28- cells out of the CD8+ T cell compartment (each with P < 0.001). Patients were grouped in those with minor restrictions (head-to-wall distance <5, chin-to jugulum distance <3, cervical rotation in sitting position >70, thoracic Schober >32, chest expansion >6 and fingers-to-floor distance <20), those with mean restrictions, and those with major restrictions (head-to-wall distance >20, chin-to-jugulum distance >6, cervical rotation in sitting position <15, thoracic Schober <30.5, chest expansion <2 and fingers-to-floor distance >50). Correlations between the level of CD8+ CD28- T cells and the extent of movement restrictions were not significant (using Bonferroni adjustment after Pearson test). Using the two-sided Pearson test and Bonferroni adjustment because of multiple testing, a trend of a correlation was obtained between the percentage of CD8+ CD28- T cells and cervical rotation (in sitting position) (P = 0.165) (see Supplementary Table 2). Based on these results and clinical experience, a metrology index was calculated summarizing cervical rotation (in sitting position), chin-to-jugulum distance, thoracic Schober, chest expansion, and fingers-to-floor distance. There was a significant correlation of this index with the percentage of CD8+ CD28- T cells, but not for the scores for the Health Assessment Questionnaire (HAQ-S), Bath Ankylosing Spondylitis Functional Index (BASFI) or Bath Ankylosing Spondylitis Metrology Index (BASMI) (P = 0.032 for the metrology index, after Bonferroni adjustment for multiple testing, Fig. 4) [22,23,24]. No correlation was found between the percentage of CD8+ CD28- T cells and the erythrocyte sedimentation rate, blood counts, disease duration or time since onset of symptoms. 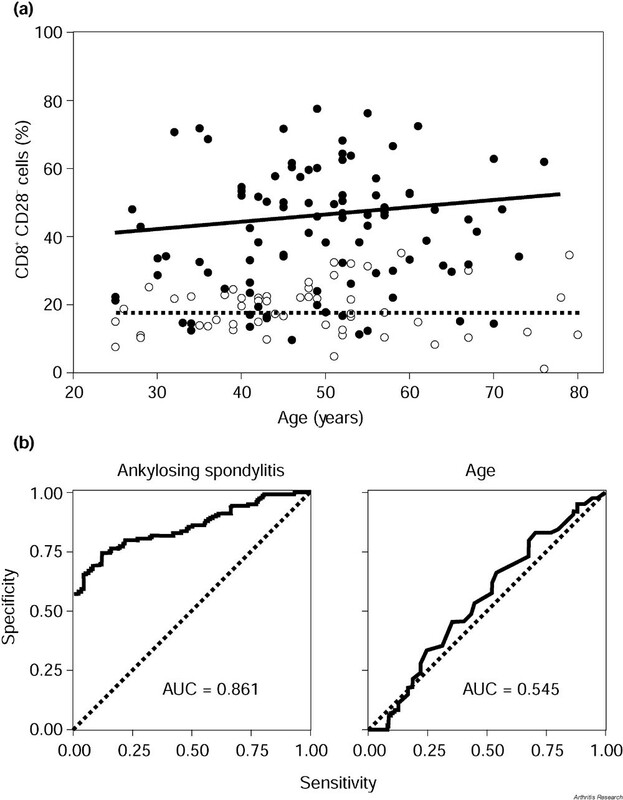 Disease status of ankylosing spondylitis (AS) and percentages of CD8+ CD28- T cells. AS patients were subdivided into groups with low, medium and high grades of movement restriction by a metrology index which includes cervical rotation, chin-to-jugulum distance, thoracic Schober, chest expansion, and the fingers-to-floor distance. Whiskers boxblots show 50% of cases within the boxes and 80% between the endpoints of the whiskers (lines). The two-sided Pearson test (with subsequent Bonferroni adjustment due to multiple testing) was used to assess statistical significance. *P = 0.032. Of the AS patients tested, 96.7% were positive for EBV-IgG and 60% were positive for CMV-IgG. 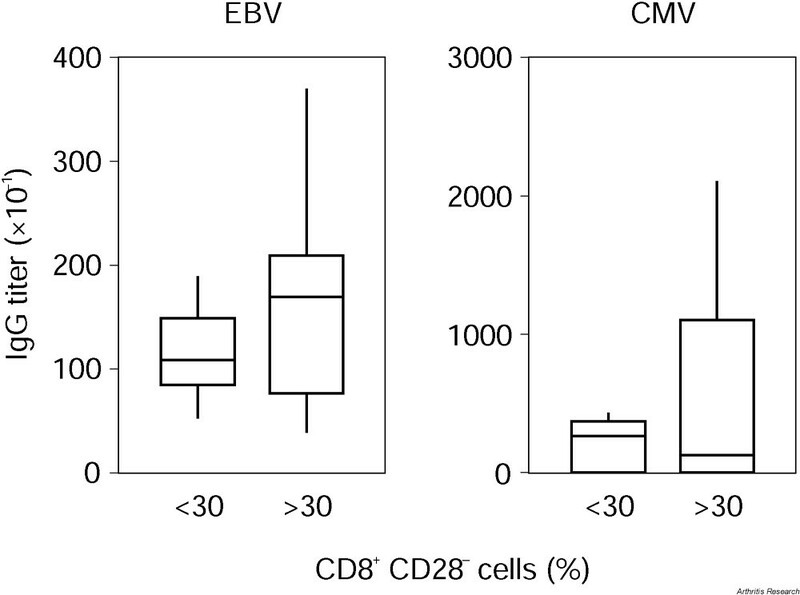 Levels of CD8+ CD28- T cells were independent of seropositivity of CMV and EBV. Levels of CD8+ CD28-T cells did not differ between patients who were positive or negative for CMV-IgG (39.4 ± 23.1% and 38.6 ± 21.1%, respectively). The CMV-IgG negative AS patients showed levels of CD8+ CD28- T cells ranging up to 77.32%. The only patient who was seronegative for EBV was seropositive for CMV, and had 60.0% CD28- T cells in the CD8+compartment. Assuming a cut-off level of 30% between normal and pathological percentages of CD8+ CD28- T cells, we did not find a difference in either CMV-specific or EBV-specific IgG titers between patients with low and high levels of CD8+ CD28- T cells (see Supplementary Fig. 1). Epstein–Barr virus (EBV)-IgG and cytomegalovirus (CMV)-IgG titers in patients with ankylosing spondylitis (AS). AS patients were grouped according to the carrier status of circulating CD8+ CD28- T cells. Carrier status was defined as expressing >30% CD8+ CD28- T cells. IgG titers were determined by ELISA. No differences were seen. Circulating CD8+ CD28- T cells (characterized by a lack of the CD28 co-stimulatory molecule on the cell surface and production of perforin) are increased not only in various infectious diseases but also in patients with autoimmune diseases like AS. The fact that the accumulation of CD8+CD28- T cells correlated with anatomical restrictions of the joints routinely measured in AS patients further underlines the pathogenic relevance in AS. This metrology index, as well as the established BASMI score, quantify anatomical restrictions of joints, whereas the HAQ-S and the BASFI scores include more complex restrictions of daily life activities. 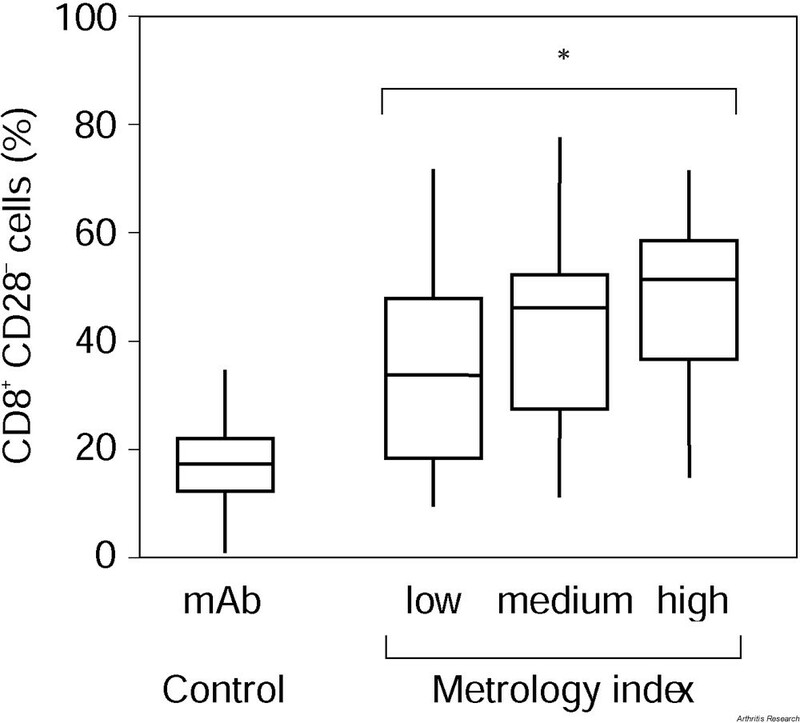 We believe that a specific metrology index might be the best tool to describe disease status as an integral function of disease duration and activity. This could explain why the percentage of CD8+ CD28- T cells in AS patients reflects the anatomical restrictions and status of disease, but not functional and life quality restrictions. In our study, the levels of CD8+ CD28- T cells were not correlated with the age of the subjects, whereas others had observed an accumulation of CD8+ CD28-T cells in the elderly, including centenarians [12,13,14]. Clonal populations known to be part of the CD28- compartment have been discussed earlier as a T cell equivalent of benign monoclonal gammopathy . Our results can be explained by the fact that 83% of our controls were younger than 60 years and all of them were preselected for the absence of acute or chronic inflammatory disease. In view of the different functions of CD8+ CD28- T cells, it is difficult to propose a specific role for these cells in AS. CD8+CD28- T cells have been reported to be effector cells, producing perforin, granzyme B, tumour necrosis factor-α and IFN-γ [10,26,27,28,29], although others have reported only low levels of tumour necrosis factor-α and IFN-γ in unselected CD8+ T cells from AS patients . Our data confirms a possible role of IFN-γ in the pathogenesis of AS. The CD8+ CD28- T cells contain clonally expanded CTLs specific for human CMV or with unknown antigen-specificity , and act as suppressor cells on antigen-presenting cells, inhibiting their ability to elicit T helper cell activation and proliferation . The peripheral increment of CTLs may develop as a consequence of an oligoclonal outgrowth of CD8+ CD28- T cells during the course of the disease , or by CD8+ CD28+ T cells preferentially migrating to peripheral sites . The role of prior EBV- or CMV-infection in AS and peripheral accumulation of CD8+ CD28- T cells is still unclear. Clonally expanded CD8+ T cells reactive against these viruses are frequently present in chronic inflammatory lesions . In rheumatoid arthritis patients, CMV-seropositivity has been directly correlated with increased levels of CD8+ CD28- T cells . It may be argued, however, that patients with more severe rheumatoid arthritis disease and higher levels of CD8+CD28- T cells have undergone more consistent immunosuppressive therapy and thus have an iatrogenic risk for CMV and EBV infections. Most of our AS patients, however, cannot be considered to be immunosuppressed, except for the fact that their immune system is disturbed by the underlying disease. As a considerable number of AS patients tested seronegative for CMV, but showed an accumulation of CD8+ CD28- T cells in the peripheral blood, the two phenomena appear to be independent of each other in AS patients. Cytotoxic CD28- T cells accumulate in the circulating CD8+ T cell population of AS patients and are associated with more severe anatomical joint restrictions. In AS patients, occurrence of CD8+ CD28- T cells is independent of prior CMV infection. Patients underwent routine evaluation by experienced rheumatologists. Clinical assessment included time since onset of symptoms, duration of disease, measurements of typical ankylosing spondylitis (AS)-specific parameters and scores including the Health Assessment Questionnaires (HAQ-S, n = 55), the Bath Ankylosing Spondylitis Metrology Index (BASMI, n = 55) and the Bath Ankylosing Spondylitis Functional Index (BASFI, n = 75) (Supplementary Table 1). All patients were screened for blood counts and erythrocyte sedimentation rate, and after informed consent, 15 ml of peripheral blood was obtained for flow cytometric studies and serology. Peripheral blood mononuclear cells were isolated by Ficoll density gradient centrifugation. Surface staining of peripheral blood mononuclear cells was performed using FITC-conjugated anti-CD8, phycoerythrin-conjugated anti-CD28 and peridinin chlorophyll protein-conjugated anti-CD3 or anti-CD8 monoclonal antibodies, respectively (Becton Dickinson, San Diego, CA). Cells were simultaneously stained for 30 minutes at 4°C and, after washing with phosphate-buffered saline, fixed with 4% paraformaldehyde in phosphate-buffered saline for 60 minutes. For intracellular detection of perforin or IFN-γ, cells were stimulated with 25 ng/ml phorbol 12-myristate 13-acetate and 1 μg/ml ionomycin in the presence of 10 μg/ml brefeldin A for four hours (Sigma, St. Louis, MO). Cells were then stained for their surface antigens CD28 and CD8 and, after permeabilization, with FITC-conjugated anti-perforin, anti-IFN-γ or control immunoglobulin, respectively. Fixed cells were analyzed on a FACS-Calibur flow cytometer (Becton Dickinson). Data were analyzed using WinMDI software (Joseph Trotter, Scripps Research Institute, La Jolla, CA). The Mann–Whitney test was used to compare the percentages of CD8+CD28- T cells between AS patients and healthy controls, the percentages of perforin or IFN-γ positive T cells between the CD8+ CD28+ and the CD8+ CD28- compartments, and the EBV- and CMV- IgG titers of AS patients with less than and more than 30% of CD8+ CD28- T cells. The Pearson test (two-sided) was used to examine the correlations between clinical measurements or scores and the percentage of CD8+ CD28- T cells. Regression analysis by ANOVA testing and ROC curves were used to evaluate the dependence of the level of CD8+ CD28- T cells on AS disease and age. Bonferroni adjustment was performed in case of multiple testing. Statistical analysis was performed using the SPSS program, version 10.0 (Chicago, IL, USA). The study was supported by the Verein zur Förderung der Hämatologie, Onkologie und Immunologie (Innsbruck, Austria) and by the Gasteiner Heilstollen GesmbH (Badgastein, Austria). We want to thank Ms. Rajam Csordas (PhD, Oxon) for her help in preparing the manuscript.